I am an avid baseball fan and former collegiate baseball player. During my time growing up playing the game the professional baseball player pay scale increased dramatically, raising the stakes for anyone playing the game from tee-ball to the pros. Watching Major League Baseball through the years, many players transformed in front of my eyes from lanky ballplayer of the 1980's to bulky players of the 1990's and beyond. With all the controversy swirling around steroids in baseball, Major League Baseball commissioner Bud Selig appointed former a former Senate majority leader and federal prosecutor, George J. Mitchell to conduct an investigation on the use of performance-enhancing drugs in the sport. With the investigation now completed the results creatively title, The Mitchell Report were released. The report calls out a number of respected and previously thought to be 'clean' baseball players as steroid users. It is now available online for you to read and cherish for yourself. Photo of the Week: Barry Bonds hit home run 755 last night in a game vs. San Diego tying Hank Aaron for most career home runs in Major League history. John Feeley was in attendance and captured history with his zoom lens in this shot (shown above). Twiistup 2: 08.08.07 - Sign Up Today! Time to for Twiistup 2, you may recall I attended Twiistup 1 on my birthday in Santa Monica, California and had a blast. If you are going to be in Venice, California this coming Wednesday (August 8, 2007) you should stop by Air Conditioned Supper Club and Twiistup too! SIGN UP HERE. Stowe Boyd dishes 5 simple steps to becoming a blogger. It is a common question, I am glad he addressed it. The new Netvibes Facebook Widget launched to allow users to view their Facebook notifications and friends. You can now access your Facebook info on Netvibes, and keep up to date on what your friends are doing. Walt Mossberg points out how Apple issued its first iPhone update this week. And, while the company billed it as merely a bug-fix and security-improvement patch, in fact it has several small feature improvements that Apple hasn’t announced or documented. Check out some Flickr tools that Mashable pulled together for Flickr addicts like me. Read/Write Web got beta access to the new Google Mashup Editor which provides a simple interface that enables developers to make basic web applications and mashups quickly. And again, like Yahoo! Pipes, it is very definitely aimed at developers. Flickr has been rumored to be adding video since August but it appears that they could do it sooner than later. MineKey is a startup that makes adding personalization to any website simple through their embeddable widget. searchCrystal enables you to perform powerful searches visually. Their wonderful platform makes it possible to explore and filter 50 - 500 web pages, images, videos, blogs in a single display that guides people toward relevant info in a structured way. I wrote up a pretty extensive list of conferences worth looking into back in January. Of course a few other conferences have popped up over the last few months. Read/Write Web weighs in on the conferences to check out. Photo of the Week: Jen Consalvo recently snapped this photo titled backlight. 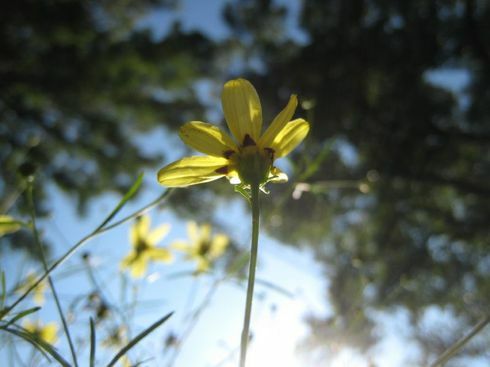 A little sunshine is a beautiful thing and is good for the soul - this little yellow guy appears to agree. YouTube has officially launched YouTube Remixer, a new service that allows users to edit their videos from within YouTube itself. Also, YouTube Mobile launched this week. Megite recently launched a discover area which offers users a place to find new things via a tag cloud and other discover links. Boulder, Colorado based Me.dium, the sidebar social network, has received $15 million in second round funding. The round of funding was led by Commonwealth Capital Ventures. Technology Evangelist points to 11 different technologies political campaign leads should know. A few people complained this week that Google Reader lost their feeds. I didn't see it, did it happen to you? The Next CommunityNext conference is coming up July 14th - are you signed up? Are you letting people track you online? If so you probably have encountered one of these stalker 2.0 applications. It wasn’t that long ago that 100,000 users was considered huge for a Web 2.0 related business. Today a small startup such as SpaceTime can gain those numbers in two weeks. 6 million users three years ago would have seemed an impossible dream, and yet it is very attainable now. This article takes a closer look. Great question and I will have to answer with a resounding 'YES!!!' I have seen bloggers go from nothing to something as little as a six months to a year. It is pretty amazing. However, I have to agree with Nick, we don't all blog for the money...the real benefits of blogging are all the great friendships that come from it. 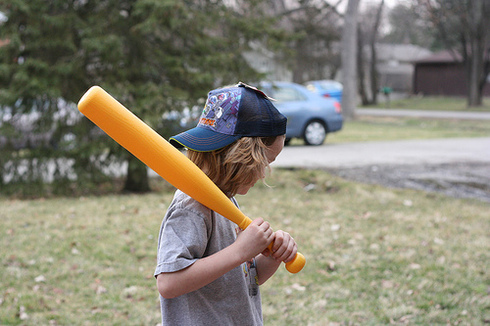 Seth Goldstein talks baseball and startups on Found+READ. Flickr opens up its doors to a number of new languages and also there is word this week that Yahoo Photos is going to be closing its doors. I'd say this is a big week for Flickr. I have a feeling Flickr video uploads are coming very soon. 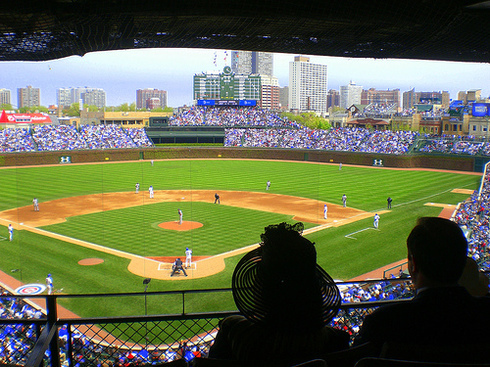 Photo of the Week: This was the view from Sweet View on Derby Day at Wrigley Field in Chicago, Illinois. Microsoft to Buy Yahoo? Nope. Stung by the loss of Internet advertising firm DoubleClick to Google last month, Microsoft has intensified its pursuit of a deal with Yahoo!, asking the company to re-enter formal negotiations, The Post has learned. Opps, false alarm. The Yahoo Photos service will be shut down in favor of the newer and more social Flickr, which they acquired in March of 2005. Peanut butter clean-up? Participating user-partners will be treated as other content partners and will have the ability to control the monetization of the videos they create. Once they’ve selected a video to be monetized, we’ll place advertising adjacent to their content and share the revenue with the content producer. Now that Web 2.0 is growing up, scale no longer matters. GigaOm explains how even tiny businesses—like transcription services—can go global. What a fantastic and easy way to promote your auctions or Ebay fund raisers on your blog! The set-up for this widget is very simple to figure out. There are no technical hurdles for newbies to worry about. While the upcoming iPhone launch is capturing the lion’s share of attention in the Wireless industry, the re-introduction of Mobile Banking has been at the core of a movement to make a cell phone your next wallet. 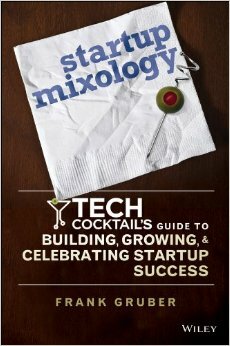 Calacanis’ latest, Project X, Kokua? Jason Calacanis, co-founder of Weblogs Inc., and now an entrepreneur-in-action at Sequoia Capital is working on a new company called, Project X. Valleywag published some details about the company earlier this week, that has the apparent backing of Mark Cuban. I am hoping Mark also buys the Chicago Cubs at seasons end. The tech conference business continues to amaze me. They are true champion revenue generators of the web 2.0 area. Google’s personalized home page, Google IG, has been rebranded as iGoogle and launched at igoogle.com. I sent 1,327 text messages last month, many of which were related to twitter so I have to say that I did not write anywhere near 1,327 blog posts in the same time. Marshall Kirkpatrick explains how he is has been twittering a lot more than blogging as well. Looking to play a team sport like baseball or football but unable to field a full team? You are not alone. With Sportsvite you may be able to scream - GAME ON! Sportsvite, a New York and Northern Virginia based startup, offers a place on the web to organize active sports and connect with other players for league teams, pick-up games and activity groups. Sportsvite offers a unique opportunity to connect with local athletically inclined people. With Sportvite, users post sporting interests, photos and other information to enable community members to connect to play a sport. 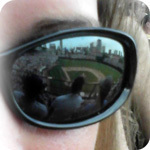 Sportsvite offers users the ability to create games, teams and find players and post listings. Sportsvite users can also manage their sports schedule on the site. Sportsvite is a free service looking generate revenue from advertising and listings. Sportsvite offers a unique opportunity to connect with local athletically inclined people. I did a few searches for Sportsvite users that were interested in baseball in my local area and was pleasantly surprised by the number of results. I also liked the added touch that the rotating sports quotes that appear along the top left edge of the site. Check out this humorous video about how Sportsvite might be able to help you - stop playing with yourself. Bottom-line: Sportsvite offers a social network to help connect users with sports lovers looking to play team sports. Photo of the Week: Opening Day 2007 for Major League Baseball is today so enjoy the photo above by Betsy titled New hat, in honor of the start of the 2007 baseball season. "Hahaha, I'm just playin' ladies. You know I love you." In all honesty, it actually would make sense for TechCrunch to take on some other brands to expand its reach. iTunes will launch an all-you-can-eat subscription service in June, according to sources at Apple Inc. The service, which will cost around $100 a month, will offer unlimited downloads of videos and music tracks from iTunes’ extensive catalog. One of the oldest blogs in existence, Scripting News, run by software and web pioneer Dave Winer, is celebrating its 10th anniversary on April 1, 2007. Congrats to Dave Winer for keeping it real for so long. Do you ever get blogger fog (similar to writers block)? It could happen and this article addresses 9 post ideas you could fall-back options. Pronet Advertising looks at the most popular brands surfacing on Digg these days. I recently became single again after a couple of year relationship so I figure it best I find out what is going on with the online dating scene since I just don't have the time to go out and find people to date these days - I hardly have time to get ample sleep. ProgrammableWeb has posted some interesting mashups that are worth checking out if you have some free time. BlogRovr is an interesting new way of getting blog information, on the go while you're surfing the Web. It is a download plugin for Firefox 2.0, which works cross-platform on Windows, Mac and Linux. There is currently no IE plugin, but plans to support for IE6 and IE 7 soon. TailRank, a popular blog news organizer that competes with TechMeme and Megite, has opened up its back end and will provide the service as a platform called Spinn3r for application developers who would like to add a blog index and ranking service. Spinn3r is said to have a 1 million blog index. What is Green Monster Games? Green Monster Games is a startup founded by an interesting combination of people which includes Boston Red Sox pitcher Curt Schilling, the creator the the comic book Spawn, Todd McFarlane and sci-fi writer, R.A. Salvatore. With this all-star cast of founders it appears they are hiring programmers to actually develop the product. GMG is looking to change the landscape of online gaming. It is not totally clear what type of games they are looking to create but I think it would be safe to assume that it is going to be some sort of epic journey looking to engage players for hours and hours (i.e. Second Life or World of Warcraft). Wow, FanClub takes fantasy baseball gaming to a new level as it is empowers the people via the web to manage a baseball team. It will be interesting to see how the fan managed Flyers do. If they do well, I wonder if the Chicago Cubs could look into something similar for the remainder of the season? 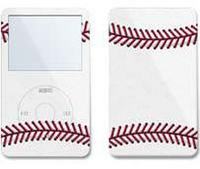 Major League Baseball has a new addition to its bench - the Apple Video iPod. The Colorado Rockies and few other ball clubs have adopted the use of the Video iPod to watch prepare for baseball games by dissecting player swings and pitcher mechanics. "It wasn't like we invented the wheel. We're using Apple's technology as best we can. We figured if you can watch music videos by rock 'n' roll and by country, why can't you watch at-bats by San Francisco and pitches by Jason Schmidt?" As a former baseball player who used to have my at bats video taped to become more mechanically sound, I think this is an excellent usage of new technology. It could help a player be better prepared and sometimes thats all you need to have an edge. As Brian Jones stated, watching game tape is really not a new concept but it is a new handheld usage that makes it unique. I am a pretty heavy blogger therefore I have been using a news aggregator called memeorandum for quite sometime, to stay connected with the top stories of the day. Memeorandum recently has grown to offer Ballbug, which tracks the latest baseball happenings. Check out this post on Somewhat Frank to find out more. 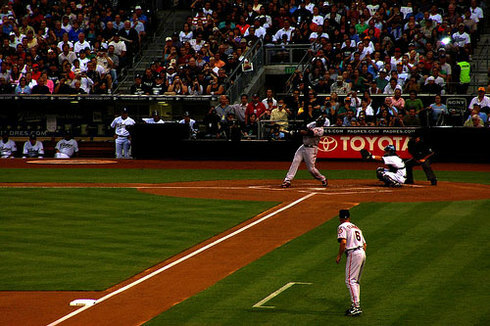 With opening day of the 2006 Major League Baseball season today for most teams, Gabe Rivera launched Ballbug which tracks the latest baseball stories, blog posts and happenings. Being a huge baseball fan, Ballbug just made my life easier. The launch adds yet another memeorandum vertical to Gabe's line of aggregators and Mike Arrington of TechCrunch wonders which vertical will Gabe tackle next. What will it be tracking ... Health? Fashion? Travel? College sports?